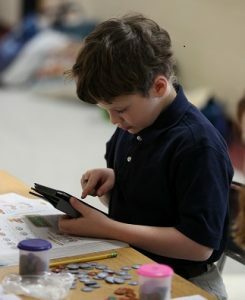 St. Francis School provides students and staff access to the latest technology that enhances teaching and learning. We use technology to nurture the ministry of Catholic Education and to promote educational excellence by facilitating resource sharing, innovation, collaboration, and communication. All classrooms are now directly connected to our LAN. This schoolwide network makes it possible to start a project in the computer lab, save it to our file-sharing server and continue the project in the classroom. Classroom computers allow teachers and students to access Microsoft Office (Word, PowerPoint, Excel and Publisher) and Hyperstudio. All computers in the school have access to the Internet. This allows teachers and students to access the Renaissance Learning Programs (Accelerated Reader, Accelerated Math, STAR Reading, STAR Math), the Michigan e-Library’s online databases, as well as an unlimited number of online resources. To enhance instruction and enrich curriculum, multimedia projectors are in each classroom. This enables teachers to project PowerPoint presentations, the Internet and digital videos (both DVD and streaming videos from United Streaming). 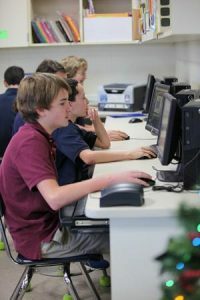 Currently, St. Francis School maintains one computer lab supporting a Windows-based platform. Lab replacement is on a three-year rotation to ensure our students and teachers have access to current technology and software. Teachers and students at St. Francis School make effective use of classroom and lab computers. Additionally, teachers and students use technologies such as digital cameras, multi-media projectors, InterWrite tablets and IPEVO document cameras to deepen the learning experience and supplement the curriculum. Effective and engaging software and online learning resources play an integral part in every curriculum, providing students with the opportunity to develop the skills necessary to succeed as a 21st-century learner and leader.